Fifteen years in the making, NORTHERN SOUL, the debut feature from photographer Elaine Constantine, offers a a loving, warts-and-all trip through the ballrooms and music halls of northern England in the mid-'70s, when small groups of restless youths flocked to hear DJs spin obscure American soul and R&B records. The biggest challenge for any film that focuses on a such a time- and place-specific subculture is winning over viewers, like myself, who lack first-hand nostalgia for, second-hand knowledge of, and, let's face it, active interest in the underground scene in question. Where NORTHERN SOUL succeeds is in capturing not only the teenage sweat and desperate energy the dispirited youth expended throughout the Spartan, aging working-class dancehalls, but also the oppressive blue-collar determinism - a worn, tired path wending through vocational schools, assembly lines, council flats and state nursing homes - that drove the hungry young out of their homes in search of something kinetic, vital and new... a search that ultimately led them to the buoyant bass, ineffable harmonies and clarion horns of the Detroit and Philly sounds. 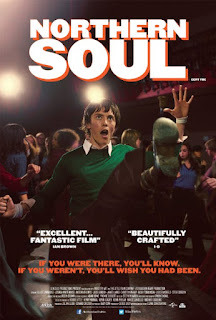 When John Clark (Elliot James), a frustrated teenage misanthrope whose greatest accomplishment was appending the spray-painted words "is a sh*thole" to a sign for his hometown of Burnsworth, chances upon Matt, a brash aspiring DJ, at the local youth club, he is introduced to the northern soul scene. Immediately compelled by the relentlessly catchy, exotic sounds of black American musicians whose records were neither marketed nor distributed in the UK, John joins Matt in the pursuit of his dream: save up enough money to travel to America, load up on rare 45s, and return a wax-spinning legend. Constantine's background as a photographer is fully evident in the way she captures the physical energy of the ballrooms through lighting and the movement of the actors rather than the showy, swooping movement of the camera. The choices she makes as NORTHERN SOUL's lone screenwriter, however, leave something to be desired. While she demonstrates obvious affection for her characters and ardent, perhaps overwhelming, nostalgia for the time period, the journey John Clark and Matt make - from their initial escape from mundanity into music, through to the first loves, drug problems and arguments about the true meaning of the northern soul scene - feels so typical of [insert subculture] historical dramas that it blunts the impact some of the more interesting factors that drove the Northern Soul DJ movement. For example, music fans with a gotta-catch-'em-all collecting bent or curatorial passion will find an immediate connection with the film's DJs, whose reputations were staked on their ability to scour used bins, flea markets and junk sales for elusive never-heard R&B 45s that had somehow made their way across the Atlantic. In this way, a scene that was in many ways like any other - the reason to get out, the skin-to-skin contact, the drugs and the sense of identity - was driven by rarity. The scarcity of a song, the specialness of a record, and the celebration of the DJ who discovered it and brought it to the people. At its worst, some of the film's more cliched (albeit often wholly relatable) moments risk turning Constantine's work into an inadvertent thesis on the homogeneity of counter-cultural movements. But at it's best, and in its bass-rattled heart, NORTHERN SOUL is not just a celebration of a single moment in British cultural history, but of an entire pre-digital age when music was a physical, personal currency to be actively pursued, uncovered, coveted and savored.